We manufacture three-dimensional castings of antique buttermolds from our private collection. 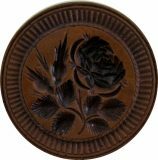 The original molds are hand-carved, wooden stamps ranging in size from 2 3/8" to 5" in diameter. The more common motifs are pineapples, strawberries, cows and wheat sheaves; but we also own more unusual molds like a rooster, an anchor, a shell and a sheep. A buttermold was a kitchen utensil used to stamp a decorative design on hand-churned butter which had been packed into a crock. We also manufacture a line of cranberry-colored, cinnamon-scented 100% beeswax ornaments. Many of the designs are made from both antique and modern chocolate, cookie and candy molds. The originals have become a desirable commodity for collectors of American folk art. In addition to the beauty of the detailed carving of an old mold, the symbolism attached to so many of the patterns is intriguing. Each buttermold design you purchase will come with a card briefly telling about the buttermolds and listing the various symbols. We offer our buttermold designs as decorative wall hangings cast in hydrastone with a hanger set into the back. They are then stained to look like the original wood molds and a light coat of satin acrylic is applied to give the piece the soft buttery oil-soaked patina of a well-used mold. This form of our product is meant to be decorative only and should not be used on food goods. These castings create a lovely effect of color and texture used either singly or as a group. they are especially appropriate in a country-style setting. Recently we have started producing a number of the butter pat and smaller sized molds in a food-safe form to use as a stamp with cookie dough or butter. These remain the white color of the hydrastone but are coated with several layers of a FDA approved food-safe glaze. They come with directions for use. Lois and David Kwantz have owned the Butterstamp Workshop since the 1970's. Since owning the company we have added our new line of Beeswax Ornaments. Send mail to kwantz55@hotmail.com with questions or comments about this web site.